SSAC is proud to be the go to location to find out what workshops are happening in our community. 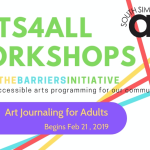 On this page you will find workshops offered by SSAC, workshops run by our members at SSAC, as well as workshops and classes offered by our members throughout South Simcoe. Please refer to each workshop listing for registration information and details. 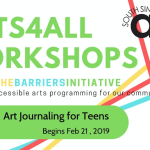 These Arts4All Workshops are generously supported by grant funding through the Ontario Trillium Foundation and community donors. 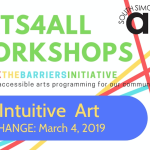 This grant allows us to offer professionally taught classes at no-cost, low-cost, and subsidized rates with the intent to remove the barriers that hinder our community from participating in the arts. To view these offerings please visit the Arts4All section of our Workshops Menu. 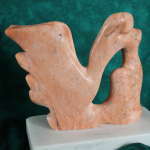 This multi-media arts program offers you the unique experience of creating with your loved ones using a variety of sculptural and painting materials. 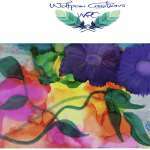 A wonderful opportunity to create expressive works of art in numerous colours, techniques and styles. 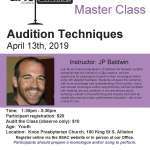 Improv is the perfect class for new actors to jump in and try their hand at performing And it is an awesome class for seasoned actors to work on building new skills and thinking creatively. Either way, Improv-Tastic is just right! 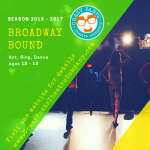 If you have a kid that loves musical theatre and sings all over the house this class is the perfect fit. The holiday season is approaching and this workshop is a great way to get prepared for it! In this workshop, you will learn how to make a set of wine charms, perfect for an upcoming party or to give as a special gift. 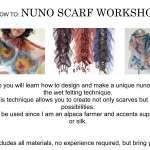 In this workshop you will learn how to design and make a unique nuno felted scarf using the wet felting technique. Learning this technique allows you to create not only scarves but as unlimited possibilities. 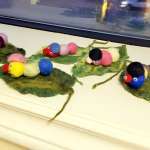 In this workshop you will learn how to make unique felted flowers and beads using the wet felting technique. Learning this technique allows you to create not only flowers but has unlimited possibilities. BACK BY POPULAR DEMAND !!!! 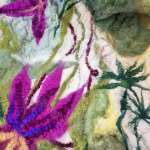 Join Dorothy Shelton of Wolfpaw Creations in this interesting workshop. 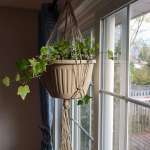 make your own decorative panels for you garden or home with melted wax, encaustic iron, and stylus. 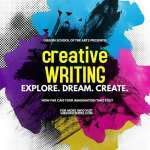 Are you wanting to delve into creative arts but don't know where to start? Are you an Artist that is feeling 'blocked' and need to kickstart creativity? 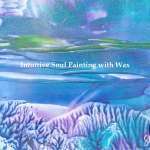 Where ever you are at Lisa Harpell from Creative Madness Art Studio will lead you through a relaxed creative atmosphere and help you tap into your own intuitive creative skills. There is no right or wrong when grabbing paints and sculpture materials in this class. 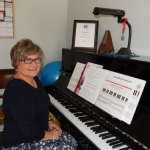 Perfect for all levels and helpful for those looking to use the arts as a way to release tension, stress, and anxiety. Shake off the winter blahs with spring cherry blossoms as the muse for this paint party. This fun and social group painting class with artist, Lisa Rosati, will have each participant going home with their own painted canvas. Tea and snacks will be served. 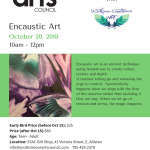 Encaustic art is an ancient technique using heated wax to create colour, texture and depth. It is an amazing medium that anyone can do. It enables a return to childlike play with colour and imagination. 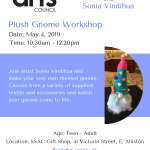 In this workshop you will learn how to design and make a unique 3D seamless hollow object using the wet felting technique and a simple plastic resist. 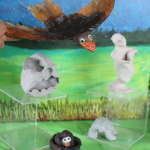 Your child can join felting artist Angela Volk and learn how to create basic wet wool felting art. 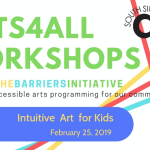 Open to ages 4+ this class has limited spaces. 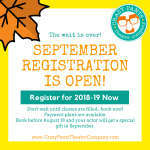 Register early. 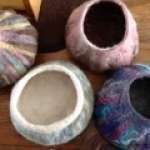 Join felting artist Angela Volk and learn the fundamentals of Nuno Felting. 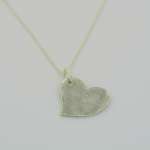 Each participant will make a piece suitable for pillow covers or a small scarf. Limited space is available, make sure to register early. 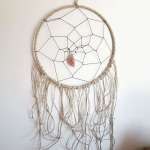 Your child can join macrame artist Jessie Mead of Macra-Me-Crazy and learn how to create their very own dream catcher. 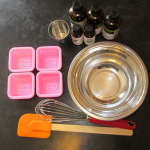 Cost includes instruction and all materials. 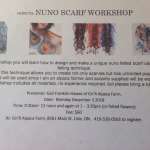 Join Gail at Gn'R Farms for this great 'How to class' in Nuno felting with alpaca fibre. 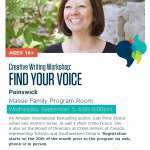 This workshop takes place on location at the farm. 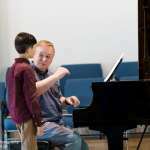 Your child will thrive in this amazing summer musical program. 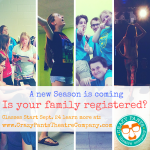 At Crazy Pants Theatre Co. summer musicals are jam packed with excitement and creativity. 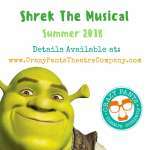 This is one of their most popular yearly programs and performances where they take a full scale musical and get it stage ready in four weeks. 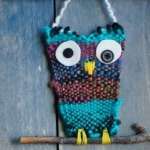 Learn to knit with this cute craft! No experience needed. If you have your own knitting needles, please bring them along. Play with various colour techniques on tile and paper. 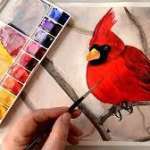 A cardinal will be the subject of this fun class. 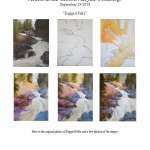 Artist Lisa Rosati will teach young artists to sketch and paint with water colour. Each young artist will go home with a cardinal card of their own creation. 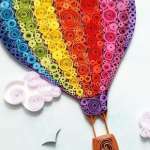 Create a fantastic picture using only curled paper and your imagination. 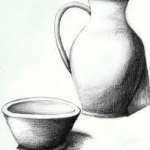 Learn various pencil drawing techniques working from a still life set up. 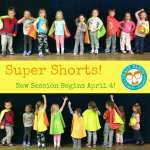 Your young actor will feel amazing when they put on their own cape and become SUPER ACTORS! 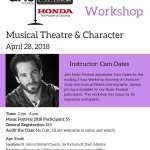 Join adjudicator Cam Oates for this exciting 2 hour Workshop focussing on character study and musical theatre choreography. 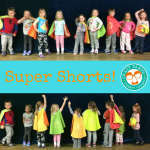 Your young actor will feel amazing when they put on their own cape and become SUPER ACTORS! 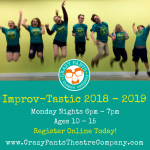 Each class will be packed full of fun helping your child gain confidence and focus as they participate in theatre games that encourage teamwork, movement, character, creative thinking, and so much more! And on their final class day, they get to show off all their Super Skills to family and friends. 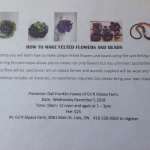 Wolfpaw Creations brings this exciting Alcohol Ink Workshop to the SSAC. Make sure to register early. 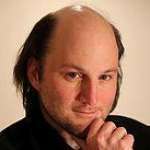 There are only 6 spots available in this workshop. 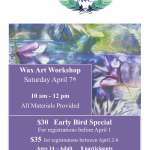 Join Dorothy of Wolfpaw Creations for this incredible Wax Art Workshop. 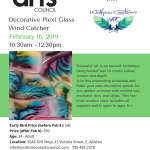 Make sure to register early as there are only 8 spots available in this fantastic class. Learn new ways to use acrylic paints and mediums to build works on paper, birch panels and/or canvas. Play with different acrylic gels and mediums to find out what they will do; try interference colours and metallics. Learn all about acrylic painting with artist instructor Nahid Azari. 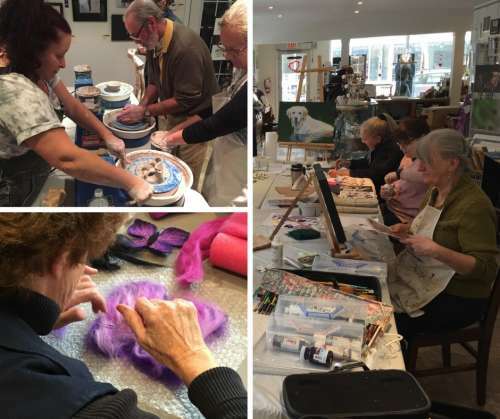 Explore blending colours and values, practising brush strokes, and using different techniques to capture various textures and effects with acrylic paints. 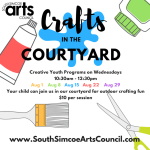 The South Simcoe Palette Club is excited to offer this fantastic workshop. 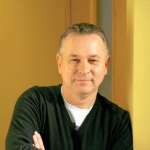 From Tom Thompson to Robert Genn, Wendy Birmingham, Monica Burnside and Ryan Sobkovich, artists have in their own unique voice presented the passionate presence of the landscape; Ontario and afar. 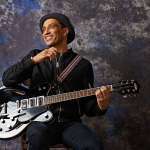 In this one-day intense workshop, Andrew Sookrah will focus on rocks, water and everything else connected to them. 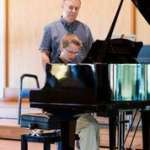 Offered in both Afternoon and Evening sessions to accommodate everyone's schedule! 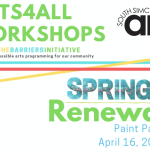 Learn new ways to use acrylic paints and mediums to build works on paper, birch panels and/or canvas. Play with different acrylic gels and mediums to find out what they will do. 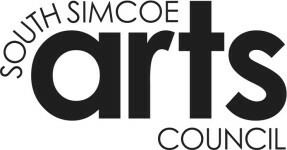 This 30-minute 'People's Choice' painting competition is a staple on the SSAC calendar and with cash prizes up for grabs each year it brings people out from all over our county and beyond. Only 40 participants will be allowed to battle it out and spots are given out on a first come first served basis. 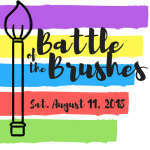 We recommend registering in advance to secure your entry in the battle. Cost of registration is $5. 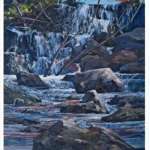 The Artists at the Gibson are excited to have artist John Stuart Pryce, of Victoria, BC, teaching an acrylic workshop on September 19. 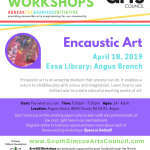 Join Dorothy of Wolf Paw Creations at Bruno's Cafe in Alcona for an encaustic wax workshop that will tap into your creative style and flow. 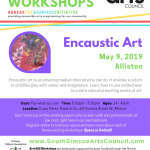 encaustic ( wax art painting workshop. 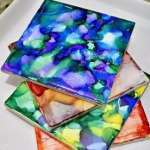 Create unique masterpieces with our specialized tools for encaustic art...Each piece will be as unique as you. It teaches letting go and releasing the urge to control. Synchronicity happens when we align with the flow of the universe rather than insisting it flow our way. When we let go of tension and stress, the magic happens. 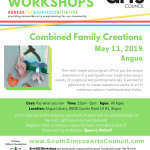 Join Lisa Harpell of Creative Madness Art Studios for this exciting workshop. This class gives the best of both worlds , it involves sculpture materials with painting. 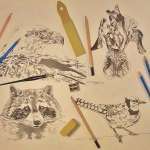 Join artist Lisa Harpell of Creative Madness Art Studios and be prepared to put a little muscle into your work. 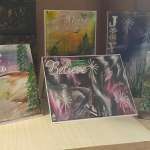 Each student will create multiple pieces of wax art during this two hour workshop which will be mounted on a card with an envelope. 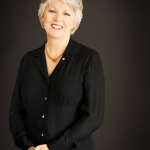 Join Dorothy Shelton of Wolfpaw Creations in this interesting workshop. make your own decorative panels for you garden or home with melted wax, encaustic iron, and stylus. 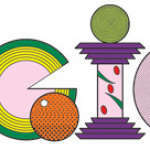 This two hour creative class includes all supplies and is pen to ages 14+. MW_AATG - Artists at the Gibson: Supercalifragilistic Acrylic!